Saladin (ca. 1137-1193) - Saleh ed-Din Yusuf (Saladin is his Latinized name) is regarded by Muslims as one of the greatest defenders of Islam in history. He fought in the Third Crusade and participated in some of the most memorable battles against his nemesis, Richard I and others (see the Third Crusade). However, he was not Arab, he was Kurdish. Little is known of his childhood other than the fact that he was born in Tikrit (the city in which Saddam Hussein was born). His rise began in 1163 when he accompanied his uncle, Shirkuh, to Egypt. Shirkuh was a military commander in the service of Nur-ed-Din of the Seljuk Turks. Nur-ed-Din was the son of Zengi (the Muslim leader of the Second Crusade). Egypt was in the midst of a civil war and one of the sides had turned to Nur-ed-Din to tip the scales in its favor. Shirkuh invaded under the pretext that Nur-ed-Din would help end the civil war, but his real motive was to take control of Egypt himself. He was victorious, but the new Fatimid vizier, Shawar, expelled Shirkuh from Egypt (with help from the Crusaders). To make a long story short, everything ended up working in Saladin's favor. Shirkuh returned in 1169 and killed Shawar. Now Saladin's uncle was the new vizier, effectively placing Egypt under the control of Nur-ed-Din (there was a caliph, but he was young, weak and a mere figurehead). But Shirkuh himself died only two months later, and Saladin became the new vizier. Then the Fatimid caliph died in 1171, and Saladin took over Egypt. That was the end of the Fatimid Caliphate and the beginning of the Ayyubid which he established (he would eventually fold it back into the Abbasid Caliphate). Now Saladin was in a position to turn the tables on Nur-ed-Din. It was he who conquered the Turks when Nur-ed-Din died in 1174. And with the Muslims in the Holy Land now unified under a single leader, he turned his attention to the Crusaders. However, his first battle against them was a disaster. His army of over 25,000 men was thoroughly defeated by a force of only 500 Templar knights supported by a couple thousand infantry soldiers at the Battle of Montgisard in 1177. It was Saladin's first attempt to capture Jerusalem and it failed. It was an important victory for the heavily outnumbered Crusader army. But it simply bought time. 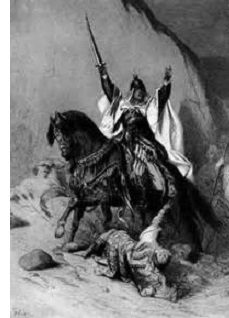 Ten years later, Saladin had rebuilt his army and crushed the Crusaders at the Battle of Hattin (often called the "Horns of Hattin" because of the land formation at the sight of the battle) in 1187. This left the city of Jerusalem virtually undefended and Saladin captured it three months later. The capture of Jerusalem led directly to the start of the Third Crusade and the arrival of Richard the Lionheart. Although the two were rivals, the sources indicate that a mutual respect had developed between them, and many of the Crusaders looked upon Saladin with great admiration.